Joyce & Lenman, 1844-1862: A.J. 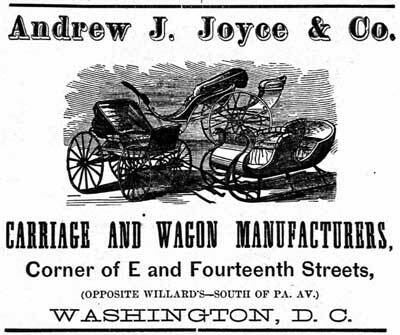 Joyce & Co. 1862-1888; Andrew J. Joyce’s Sons; 1888-1897; Andrew J. Joyce Carriage Co. - 1897-1908; Washington, D.C.
Unsurprisingly Andrew J. Joyce’s main customer was the US Government for whom he built, refinished and repaired numerous carriages and wagons during the second half of the nineteenth century. His clients included the Treasury Dept., Dept. of the Interior, Smithsonian Institution, National Zoological Park. 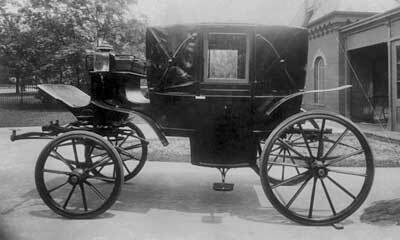 During the later part of its history the firm employed Hermann A. Brunn who in 1907 designed at least one body for a horseless carriage. 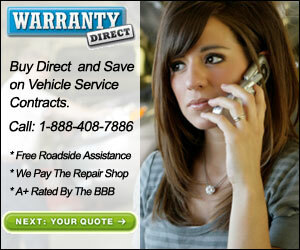 Further automobile body construction is likely, but unknown at this time. Andrew J. Joyce was born in Virginia in 1821 to an Irish immigrant father and DC-born mother (first name Hannah). After a limited education he was apprenticed to a local D.C. blacksmith, Charles Lenman, whose shop was originally located on C Street. 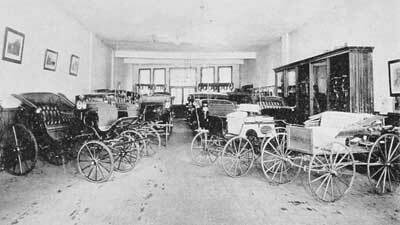 In 1844 he became a member of the firm which was subsequently located at 22 Ohio Av. and conducted in the style of Joyce & Lenman. Sometime after October 7, 1843 (date of license) he married Frances Marion Norris and to the blessed union were born nine children: Albert B. (b.1844); Frances Marion (b.1846-d.1922); Andrew J. (b.1848);Lula (b.1851); Amanda I. (b.1855); George W. (b. May 21, 1857-d.Apr. 8, 1908); Margaret (b. 1859); Robert Edwin (Aug. 21, 1863-d. Jan. 22, 1927); and Jesse M. (b. Sep.19, 1866, m. McGlinchey) Joyce. 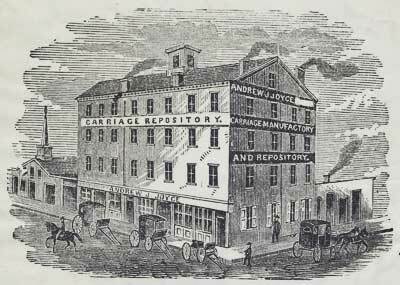 John L. Joyce was Andrew’s nephew, the son of his brother John J. Joyce, who was a well-known Washington grocer and partner in P. White & Co. - of which Andrew was a silent partner - and its successor, Joyce & Fisher. 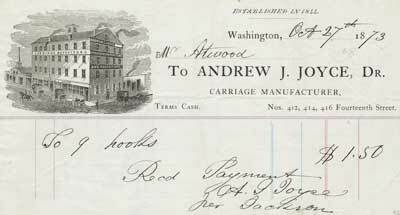 1881-82 directories list his two eldest sons, Andrew J. Joyce jr. and George W. Joyce, as clerks at 1124 11th NW which was also Andrew’s home address which most likely served as their carriage repository. 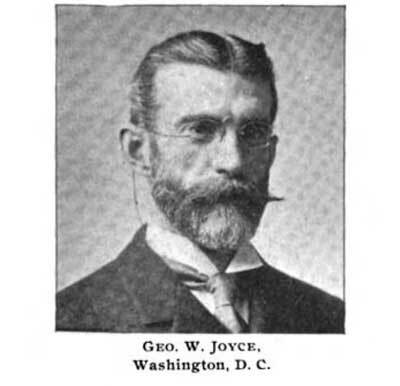 A second, unrelated, George W. Joyce (b.1847–d.1895), was also living in D.C. at the time. He owned a cigar shop at 824 18th SW and remains notable today for his illustrious career as an amateur and professional baseball player, who played centerfielder for the 1886 Washington Nationals. The 1892 directory lists R. Edwin Joyce on the masthead alongside Geo. 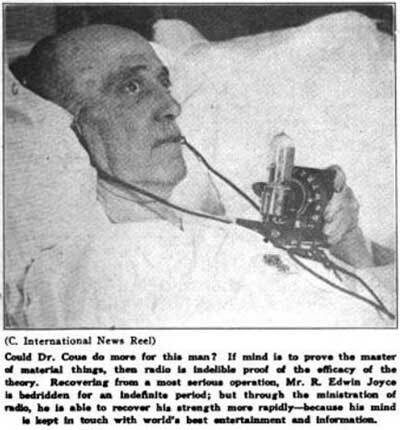 W. Joyce, with no other changes. 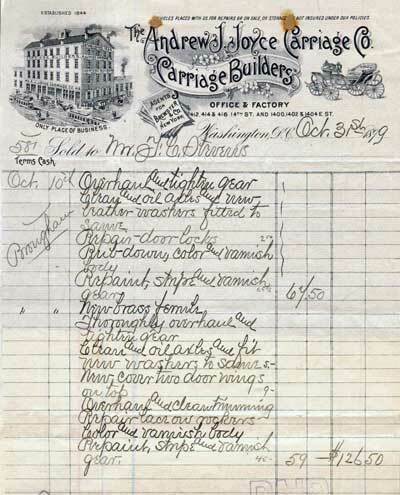 “George W. Joyce, carriages, 456 Pa av NW, h. Chevy Chase. Md. 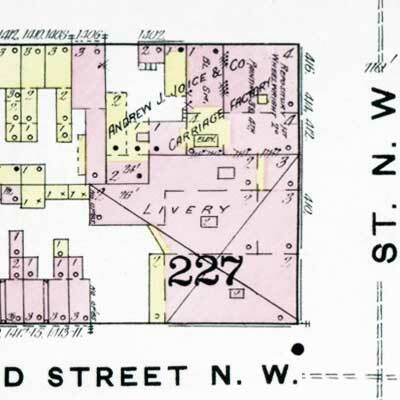 George W. Joyce’s 456 Pa av NW listing vanished by 1902, the Andrew J. Joyce listing remains the same. 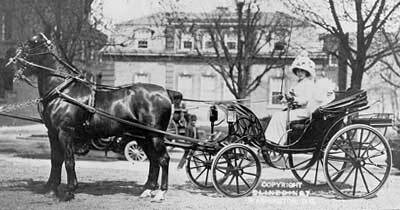 Hermann A. Brunn, the legendary Buffalo, New York coachbuilder and designer, briefly worked for the firm after he completed his employment at the H.H. Babcock company in Watertown, New York. I’ve seen an 11”x14” rendering of a ‘horseless carriage’ he made for the Joyce works, signed by him and dated 1907 – the only evidence I could locate that confirms that Joyce engaged in the manufacture of automobile bodies. Brunn was in charge of the firm’s design department from 1907-1908 when the closure of the firm due to the unexpected death of George W. Joyce on April 8, 1908 prompted his return to his hometown of Buffalo where he founded Brunn & Company later in the year. In order to settle his brother’s estate R. Edwin Joyce was forced to sell the firm’s Fourteenth and E Streets factory after which he associated himself with the American Multigraph Sales Co. for whom he served as their US Government sales representative. A the end of the First World War he was taken ill for a couple of years, and on recovering took a position with the Federal Board for Vocational Education, 1410 Pennsylvania Avenue, Washington D.C.
Born in August 21, 1863, Robert Edwin Joyce passed away on January 22, 1927 at the age of 63.